The NFL is lousy with head coaches who have been given multiple chances at running a team despite achieving little on-field success. A coach can fail, get fired, and still find himself patrolling a sideline within a year, and the best way to go about pulling off such a feat is to control one’s own narrative. This seems to be something that just-fired former 49ers head coach Chip Kelly understands. After a tenure in Philadelphia that started out promising but ended ignominiously and a disastrous one-and-done season in San Francisco, it would be fair to mark Kelly as a guy who doesn’t deserve another head coaching gig in the NFL. But the 49ers did Kelly a favor on Sunday by also firing general manager Trent Baalke, who has presented himself as a nice scapegoat for Kelly’s failed season. Yesterday, Fox NFL insider Jay Glazer went on All Takes Matter and shared some details from a phone conversation he had with Kelly. According to Glazer, Kelly believes he was being undermined for “weeks and weeks” by Baalke, who was doing everything he could to get Kelly fired. Glazer added that Kelly told him he’d be perfectly happy working as an offensive coordinator next season. Maybe that last part is true, but there’s a chance Kelly won’t even need to consider stepping down into a coordinator’s role. After all, what NFL team wouldn’t want a guy with Kelly’s humility and football mind to be its head coach? Sure, he went 2-14 last year and only managed to beat the Rams, but imagine what he could have done with Dak Prescott, the guy he definitely wanted to draft back in April! And can you blame a guy for failing when the GM was undermining him at every turn? If you really stop and think about it, Kelly is nothing more than a victim of the 49ers’ organizational dysfunction. 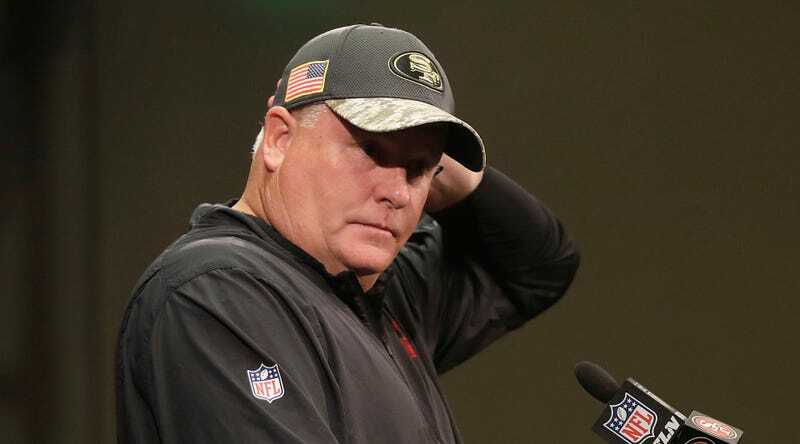 Thank goodness Chip Kelly is getting out there and revealing the truth about what happened to Chip Kelly in San Francisco.